Welcome back! I know it’s been a while since the last update, but we tend to underestimate how hectic competition season can be, especially when it’s intertwined with finals and such, which makes it hard to sit down and write a blog post in full. That means I have quite a bit to go over, though, so buckle up! After that came the 10,000 Lakes Regional Sponsored by the Medtronic Foundation (bit of a mouthful, huh? It makes me miss the days when it was called the “Medtronic Foundation Regional” or even just “10,000 Lakes”). Still reeling from our last competition, and founding our high expectations with some more drive practice and an improved bot, we presumed that this regional would go even better. Unfortunately, some iffy matches and unfortunate malfunctions resulted in us coming out of the qualifications in rank 40. Though we didn’t get to be alliance captains, we still managed to advance into the playoffs thanks to a very gracious pick from the team ranked 7th, Armada Robotics. They had a dependable climbing mechanism and were sturdy enough to perform some good defense, making them the perfect complement to our fast but light robot. We also picked The Breck Stampede, on whom, per their signature cheer, you can’t impede. We were pretty confident in this alliance, but we would face a similar situation to that of Duluth – success in quarterfinals, facing an incredibly good alliance in semifinals, eventual loss. It wasn’t all bad, though – our team’s long-running inside joke about “sending it”, the tactic of sending the robot careening to the second climb level named after a viral snowmobiling sensation, finally came to fruition. To our collective excitement, we successfully “sent it” in multiple playoff matches! So, anyway, all of that leads me to good news and bad news. The bad news is, unless we receive a wild card that grants us entry to the Detroit international competition (which is looking unlikely at the moment), we won’t be eligible for any more official FIRST events this year. The good news is, due to our unprecedentedly good performance at our first regional, we’ll be competing at the MSHSL Robotics State Competition in May! A bit of context: for robotics to be considered a sport in the state of Minnesota, there must be a State Championship, which is why this particular event exists. (Some states have similar events, but most don’t, as it’s not required by FIRST). Entry into this event is based on the amount of “district points” a team receives at their first competition, which are determined by rank, performance, and the awards a team wins. Normally, we don’t get all that many, but ranking fourth has its perks! In other words, the 2019 season isn’t quite over for us just yet! As always, you can keep up with the Automatons via Twitter. There are more updates to come, so stay tuned! Hello again, Automatons fans! Thank you for continuing to support the team and keep up with what we’re up to. Two days ago was “stop build day”, more commonly known among FIRST participants as “bag day”. It’s the day when we have to cease all work on the robot and store it in a plastic bag until our first regional competition – or it was, anyway. This past bag day was actually the last one FIRST is ever going to enforce; come next year, teams can continue working on their robots indefinitely. It’s sad to see bag day go, but we made the best of what we hope to be our last late-night robot building session. To quote our coach, this year’s ‘bot is “one of the most functional robots we’ve ever bagged”. The jury’s still out on its name, but rest assured we’ll come up with something sooner or later. That’s all for now! See you at the Northern Lights regional on March 7th! Hey everyone! 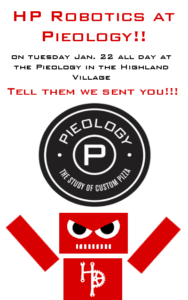 The Automatons are having a fundraiser at Pieology! Details are on the picture below. Make sure to mention our name while paying! Hello, everyone! Thanks for your continued support, because build season is finally here! Last Saturday was Kickoff – for those not in the know, Kickoff is the day that we FIRST Robotics teams get our yearly challenge. It’s a pretty big event in the FIRST community, since it gives way to build season, which is six weeks of labor-intensive planning, building, and testing! Basically, robots must be capable of carrying at least one of two objects, the “hatch panel” (donut-shaped object with velcro) and the “cargo” (kickball), and placing them in succession onto those rocket-shaped structures to ensure that cargo is securely “stored” on these ships. This year’s game also presents a new challenge; instead of Autonomous mode, where robots must run on preemptively programmed code, Deep Space has Sandstorm mode, where robots can be driven as usual but the drivers’ vision of the field is obscured. Robots also must find a way to climb onto elevated platforms at the end of the match without the help of any velcro or support bars. After Kickoff, we had a very productive strategy session, and we’ve already started on building the robot. We can’t wait to show it to you! In the meantime, be sure to check our Twitter for updates (and memes). On September 22, we ran a carwash out of Highland Park Senior High’s parking lot, spending the better part of the day cleaning cars in a slight Autumnal chill that seemed a lot colder at the time. It was a successful endeavor – we raised hundreds of dollars and didn’t have a single unsatisfied customer! Our beloved Executive Board has arranged a fun challenge for our team during the preseason that we’ve embraced to the fullest extent. Our team has been split into two pseudo-teams competing to build a KanJam robot, one named the Meerkat Fish and one TBD. We’re trying not to get too competitive, since we want to make sure we set a good example of Gracious Professionalism for the rookies. Last Saturday, a whopping 26 members of our team contributed their time and effort to the Monster Dash, a race through Team Ortho where runners are not only allowed, but encouraged, to run in costume, making it an enjoyable experience for both them and us. While we’ve had our share of major team events already, we’ve still got something big coming up: Give to the Max! It’s a state-wide fundraising event benefiting nonprofit organizations like us that takes place on November 15th. This year, we’re doing something a bit new: incentives! For a 25$ or larger donation, you’ll receive an HP Robotics logo sticker; for $100 and up, a button and notepad, and for $300 and up, a tour of our workspace. You can donate through our GiveMN link at any time, but these gifts are exclusive to GTTM, so mark your calendars! That’s all for now, be sure to follow us on social media! Hey all! We here at HPSH Robotics are happy to announce how well we were able to perform at our latest regional, the Medtronic Foundation Regional. We placed 5th overall and went to quarterfinals with our alliance partners, the Governors and Blaze Robotics. We’re also ecstatic to mention that our lead programmer, Alexis Lipstein, was one of the finalists for the Dean’s List Award. Unfortunately, we were unable to achieve our goal of winning a blue banner, and therefore this means the end of the season for us. We’d like to thank all the people who worked hard on our team in build, programming, strategy, business. We’d also like to thank our alliance partners team 3745 ,the Governors, and team 3184, Blaze Robotics. If you would like to contribute to the team, please use this link to contribute through GiveMN. Thank you! Hello again from The Automatons! Thank you for your patience regarding our website renovations. A few weeks ago, we competed in the inaugural Great Northern regional in Grand Forks, North Dakota, with our robot Lord Viktor FrankenJank. This was our first regional of the season, as well as the first of its kind and part of the first competition week, so we’ve had quite a few firsts lately. During competition, we suffered from minor technical difficulties that prevented us from using our intake mechanism, but we managed to pull through and make it into 16th place overall thanks to some great work from our Strategy and Drive teams. Though we did not get picked, we were the highest-ranked team that was not part of an official alliance, meaning that we would serve as a substitute for any team whose robot could not compete. As luck would have it, we served as a substitute for team 2220, Blue Twilight, on the 8th seeded alliance! A huge thanks to our alliance partners, Quack Attack, Tech-No Tigers, and Blue Twilight, and congrats to Gators, KAOTIC, and Mystery Machine for their win and Blue Twilight for winning the Chairman’s award! Though we did not make it past quarterfinals, we gained valuable drive practice and have been working with our shadow-bot in the weeks following so that we can come back strong at Medtronic Foundation Regional! We’re now preparing for the Medtronic Foundation Regional, which will be held at the Williams Arena at the University of Minnesota. The regional lasts from March 29th to March 31st, and you can keep up with us on The Blue Alliance livestreams as well as our twitter account. That’s all for now! See you at Medtronic! It’s been a while since our last update, but don’t worry, we’ve been working as hard as ever. Over the summer, we focused on volunteering and outreach. Some members of our team volunteered at Thomson Reuters’ Girls in Tech program, teaching middle-school aged girls how to use Scratch and think like programmers. We also attended Thomson Reuters’ Unconference, a technology fair where we demonstrated our robot Omnibus’ abilities and learned about new advances in technology, and won a First (ha) prize ribbon for our robot in the education building of the State Fair. We’ve also been working on fundraising for the upcoming season. Team members and mentors alike have been regularly volunteering at the U.S. bank stadium and Team Ortho races to help raise money for the team. This season, we’ve welcomed an influx of freshman members, which puts us at over 40 student members. Since the beginning of the school year, we’ve been working hard to teach freshmen and new members about our team, be they members of the Business team, the Build team, the Programming team, or our new Strategy team. We don’t yet know what our challenge is, so Build, Programming, and Strategy have been focused on fixing up our robots from last year and preparing themselves for this year, while Business has been focusing on securing sponsorships for the coming year. Although we haven’t gotten any game information, FIRST has released a teaser trailer for this year’s game, which is called FIRST Power Up and has an 8-bit theme. This weekend, we’ll be competing with Omnibus at the Minnesota Regional Invitational, an offseason regional competition at Roseville High School. We’ll also be at the Minne Mini on November 17th, and we’ll be volunteering at the Monster Dash on October 28th. As per usual, we’ll be having regular meetings on Thursdays at 2p.m. in Highland Park’s woodshop. That’s all for now! Thanks for keeping up with us! Follow HP Robotics on all of the official channels and share with your friends! Hello again from The Automatons! 10k was a wild ride. We played hard, worked hard, and definitely built hard. Unfortunately, we didn’t qualify for championships, but after ranking 19th with a 4-4-0 record we were the 9th pick for playoffs, which landed us on the 8th-seeded alliance with Blaze Robotics and QWERTY Robotics. Despite being the lowest-ranking alliance, we managed to secure a 2-0 win against the #1 seeded alliance! However, we went down in the semi-finals (again) due to our robot losing connection during a tiebreaker match. Besides performing a lot better than we did at Northern Lights, we also won the Innovation in Control award for our spectacular shooting mechanism that made Omnibus the best shooter there. Those that weren’t busy building or programming presented for Chairman’s and Dean’s List and did extensive scouting throughout the matches. Also, ScotBot did a bit of dancing and we got a visit from our principal, Dr. Winston Tucker! Videos of Omni in action can be found on our YouTube page. We’re currently planning a car wash on May 13th to raise money for next year, so stop by Highland from 9-2 if you want to support us (or if your car just needs a wash). Thanks for keeping up with us! Hey, everyone! Thanks for keeping up with us. On bag day (or, for the non-robotics folk, February 21st) we finally completed our robot for this year and gave it a name. Meet Omnibus! Omnibus gets its name from the fact that every component is stored inside of its box frame – besides being a name for a collection of books, omnibus is an adjective meaning “containing or including many items”. After the build process was complete, we programmed it and put it in a bag. When we went to Northern Lights, our first regional of the year, it turned out Omnibus was slightly overweight. We had to cut a bunch of holes in its frame and get rid of some components, and because of that and our lack of drive practice, we didn’t get off to a great start. With some repairs to the robot, we managed to win 4 out of our 8 qualification matches, pulling ourselves up from last place to 28th place. Unfortunately, we didn’t make it past qualifications, but we learned a lot from the competition and made tons of improvements to our robot – and once we can legally take it out of the bag again, there’ll certainly be more to come. We built a shadow-bot between competitions to test code and build new mechanisms, and since we can actually test on it and make adjustments, our outlook is even better than before. Our shooter mechanism can now get 21 kPa in autonomous mode – and it’s pretty dependable. We’ve also made improvements to our gear catching mechanism and our climber using the shadow-bot. We’ve gone from a passive gear catcher – which just catches and delivers a gear – to an active gear catcher that can actually put the gear on the spring. We also let our drive team have some much-needed practice, so now we’re pretty proficient with our robot. The business team has been working hard to perfect our presentation for the Chairman’s Award – for those not in the know, the Chairman’s Award is the most prestigious award a team can possibly win. It celebrates growth as a team and promoting STEM to one’s community. Along with that they have been working to get more sponsors to allow for more events in the near future. That’s all for now! DFTBA!